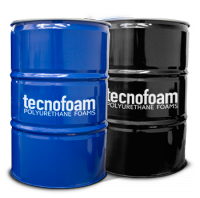 The product I 2008 is a system composed of two components (polyol and isocyanate) produces polyurethane foam of an applied density from 10 to 20 kg/m³ ,is suitable for acoustic isolation uses. It is free of substances harmful to the ozone layer and gases that promote the greenhouse effect (no contains HFCs, HCFCs, VOCs, etc ...). It is specifically designed for thermal insulation in construction, industry, farming or agricultural facilities. In applications ceilings, interior chambers facade, ventilated facades.